Ascending Butterfly: No Matter What People Tell You, Words and Ideas Can Change the World. I have to thank Getty Images and Huffington Post for this photo. Robin was definitely an Ascending Butterfly and he will be greatly missed. Butterflies, depression does carry a very high risk of suicide, if you feel you are in immediate danger or risk please call 800-SUICIDE (800-784-2433) and there is also a hotline for the deaf at 800-799-4889. Reach out for help and do not suffer in silence. 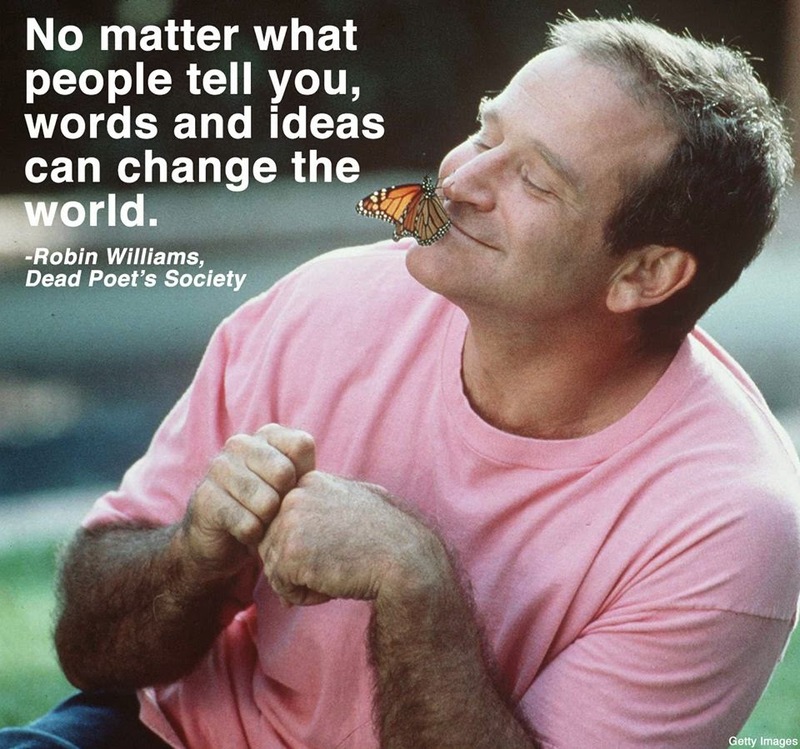 Words and Ideas can change the world. So does our Self-Talk. The most powerful two words you can combine is 'I AM', be very careful how you use them. Do you find yourself constantly saying 'I am sick, I am tired, I am Fed Up, I am Angry'? Watch your internal dialogue butterflies, and please note, men take their lives nearly four times the rate of women while women have the higher rate of being ignored by physicians or dismissed as just a passing panic attack or 'stress'. If you have approached your primary or sought treatment for depression and don't feel you were listened to or were dismissed, please do not stop trying to find a physician who will listen, and while you are trying to find the right clinician, reach out to your tribe - your friends, family, clergy, keep expressing how you feel and don't bottle anything in or internalize it! FTC Disclosure: This is NOT a Sponsored Post. You are NOT alone, please share this message with anyone you feel may be at risk! Beautiful tribute and post. I hope it reaches out and helps people. Thank you for touching on such a important subject .Depression seems to on the rise young and old are at risk. It so sad that it took the life of such a dear comic ! I enjoyed his work very much !